I've been looking for healthy snack ideas, and this one is nutritious and substantial. Hopefully it is also filling and will help me avoid the usual scenario where one snack leads to another and before I know it, I've eaten an apple, a piece of cheese, a yogurt, a chocolate..etc etc. Recipe is from Power Foods (I know, I am obsessed- I won't even try and deny it at this point). -Preheat oven to 400F. Cut tofu into about 4 sheets, and then put on a baking sheet on top of paper towels. Cover with more paper towels, and then place another baking sheet and some cans or cookbooks (anything heavy). leave to drain for 30 minutes. -Once drained, cut tofu into smaller squares, and place in a bowl with 1/2 tsp sesame oil, sesame seeds and 1/4 tsp salt. toss to combine. Place tofu in a single layer on baking sheet and bake for 12-15 minutes or until brown and crispy. Use a spatulla to flip and then bake another 10 minutes on the other side. I put it on broil the last few mintues to get it extra brown and crispy. 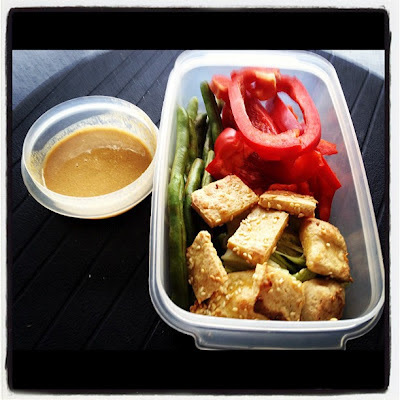 - blend together ginger, tahini, soy sauce, honey, vinegar, and water. Process until smooth. I left the green beans raw, as vegetables lose nutrients as they cook. Okay fine and because I was too lazy to cook them. Cook green beans with desired method or leave them raw, cut up red pepper and cabbage or lettuce. Divide into 4 portions and put sauce into small containers for dipping. Enjoy.